The editor of the National Barbecue Association E-Newsletter recently asked me about creative ingredients I use for traditional barbecue along with sides and toppings. You may have found my ribs and grilled cabbage recipe here on my website, so you already know me as someone who likes to experiment. Still, the question from the NBBQA got me to thinking about creativity and a departure from mainstream American barbecue. For me, barbecue is so interesting because it really is a 50/50 mix of science and art. We know the finishing temperatures, we know the technicalities of preparing meat, and we know our own secret bag of tricks. Some people would say “if it ain’t broke, don’t fix it,” but I believe that many barbecuers (novices and pros alike) love the idea of thinking outside of the box and playing around with trends and possibly stumbling on the next great recipe. For me, creativity often comes from my Asian heritage. When a recipe calls for sugar, I use palm sugar because it tastes different from white sugar. When a recipe calls for vinegar, I often use Japanese sushi vinegar made from fermented rice. I’ve also been known to use a Middle Eastern spice called sumac, which is an interesting spice that adds a lemony taste that I think is very appealing… and unique. 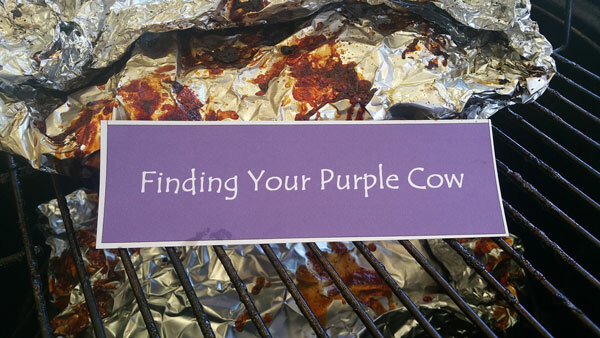 As a competitor, I apply “Harry’s Purple Cow” theory to my quest for creativity. If you drive by a cattle ranch and see a bunch of black and white cows in the pasture, no one cow will catch your eye. 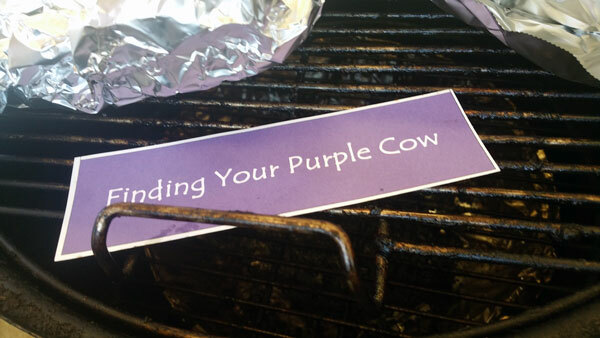 Imagine that the farmer paints one cow purple (with animal-safe paint, of course). Anyone driving by will notice that purple cow among the many cows in the field. Winning a barbecue contest is like that. With sometimes over 100 teams at a contest, the key to winning is creating extraordinary ordinary barbecue. That is, it’s just like a cow in the field but it’s purple, and so it stands out in the herd. You know the ingredients and formula of your sauce or rub, so you have the science part under control; however, what can you do to push the creativity meter? In any case, the commitment to creativity looks very different to competitors and enthusiasts. Because there is no time pressure, enthusiasts can take their time, read recipes, peruse the spice rack and talk to their butcher. If you’re an enthusiast, you more likey have a go-to recipe that you are comfortable with. For competitors like me, committing to creativity takes precision and patience. In my heyday of competition, I was on the road almost every weekend, so creativity had to be done on the fly. I also have to be scientific about changes. If I decide to use a tablespoon of palm sugar instead of white sugar, then that should be the only thing I change in that recipe. That way, when I get the results, I’ll know if that combination scored higher or lower. If it scored higher, I’ll try it again at the next contest. After each contest, I mentally do an event review and write down at least 10 things I could do better for the next contest. That’s why I need to cook 30 plus times a year to feel the flavor “rhythm” in the judges’ tent. This cycle of continuous improvement to get better and better builds momentum as the season progress. Does this process always work smoothly? No, as in reality, it’s often two steps forward and one step back. I know if I persevere and keep trying, this approach works over the long term. 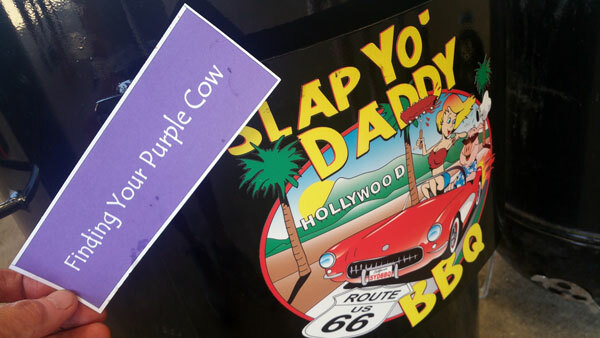 Soon I’ll have a purple cow entry going into the judges’ tent. Regardless of whether you’re a competitor or a backyarder, don’t let your success get you in a rut. 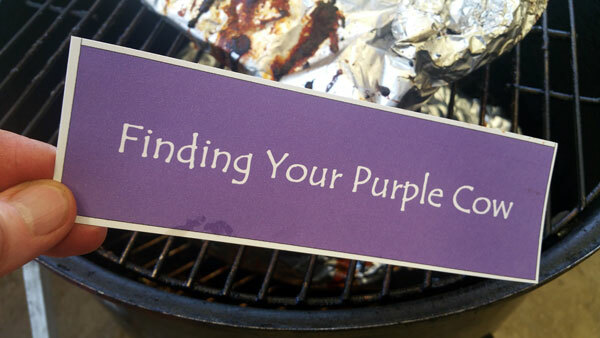 Commit to your creativity and let that purple cow out of the barn! Hey Shaun, it was a pleasure to have your help. Thank you so very much! Good article Harry. Congrats on your long successful career. Thanks Jerry. Same to you to for tearing up the competition circuit!